Venice Town Hall meeting sponsored by V2K H.E.L.P.E.R. Foundation and the Urban Peace Institute to discuss the Venice Gang Injunction in use by LAPD in the “Oakwood” area of Venice, CA. Free L.A. Kids Classes start Monday, October 22 and run 6 weeks. Winter Basketball Registration begins NOW!! Young African American Venice Children Accused of Trashing Oakwood Park. Assessed $100. A private meeting was held at Oakwood Park on August 16,2012, which excluded People of Color, Seniors, and those “Less Than Affluent” in Venice. I again request your office send the permit to hold this meeting and the $75 assessment meeting fee as this meeting was private, yet held at a public park. The organizers refuse to share the agenda and minutes of the meeting to the community. As this was a private meeting, apparently the group feels no need to share this private agenda and minutes. I am concerned about this private meeting at a LA Park which included Pacific Division Police, the Office of CD 11 Bill Rosendahl, LA Human Relations, Oakwood Parks and Recreation Director and possibly even the LAPD Violent Crime Task Force. Might discussion at that meeting have included the Oakwood Park Picnic Area? As you are aware, some Venice residents have been working to turn this picnic area into a Venice Historical Landmark. Some Venice residents oppose this area becoming a historical landmark. Two days after this private Oakwood Park meeting, August 18, 2012 , LAPD sent in the Violent Crime Task Force to Venice composed of non-Pacific Division officers who harassed Roy Davidson Sr. (see below letter from Venice resident Laddie Williams) at 5:50 p.m. because the front wheel of his bike went over the white line. At about 6:15 p.m.,the Violent Crime Task Force brutally beat skateboarder Ronald Weekley for riding his skate board on the wrong side of the street. On August 30, 2012, the leader of the Venice Bull Dogs, a 501c3 non-profit football team for Venice Residents between the ages of 5 and 14, was sent a letter (see below) from Traci Goldberg from Parks and Recs charging them a $100 assessment for a picture she was sent. The Venice Bull Dogs are adult supervised and their trash is cleaned up before the Venice Bull Dogs leave. (we are talking about a supervised group for elementary -middle school children). I question this assessment fee as “fair play” ? Adults involved in the Bull Dogs and other community residents have complained numerous times to the park regarding dog urine and defecation left on the field by residents who violate park policy and permit their dogs off leash. As well community has requested that those groups who use the Oakwood Park for kickball and soccer discontinue to drink alcohol and smoke weed during their practices/ games. Are these groups also responsible to pay a $100 assessment fee? I request an investigation into the allegations by Traci Goldberg that the trash was left by the Bull Dogs based on a picture she was sent by a local resident. TI request that the Venice Bull Dogs pay no $100 assessment fee until the investigation is complete. To this advocate, these actions by Ms. Goldberg ,Valley Interim Superintendent of Parks and Recs Charles Singer and Oakwood Park Director Liska Mendoza appear to be nothing more than continued harassment against people of color by those who prefer gentrification over collaboration and communications. Hopefully you might attend the September 12, 2012 Community Meeting at Oakwood Park which appears to be public this month. Again , please be kind enough and send the permit and receipt for those who held the August 16, 2012 private meeting at Oakwood Park. Re: CPRA Request Regarding Oakwood Park. 1. Please send me all records of Quimby Funds related to Oakwood Park and a line by line item analysis of what funds have been spent; and a current budget statement regarding Quimby Funds remaining and how much interest has been earned, and into what account does the interest earned carries over to. No Oakwood Park Board Meeting Ever Discussed the closure of Oakwood Park for an irrigation system that has locked down Oakwood Park until December, 2012 the community. 4. Please send a line item analysis showing the cost of this irrigation project and from what Park or City accounts these funds are coming. There must be some information that I missed at a Oakwood PAB meeting(attended all of them)? There was never a discussion about a year long irrigation system for Oakwood Park or the park being closed for this long ever. The line of communication must have been broken somewhere, at no meeting do I ever recall any discussion about the field having and irrigation system put in. If the community had been informed that this would be taking place and it takes a year to assemble this project then we would have stood up and protested as loud as we did when the gates were moved for no apparent reason. This is the only open green space for our community, and to have been informed by the park director that this irrigation system was needed and it would be going on for a year, oh believe me it would have been some opposition by the PAB members and the Venice community. The only discussion about the field was to have the baseball diamonds refurbished because they were in poor shape. It appears strange that when LAPD heard of the fences being raised back to seven feet( at the last PAB meeting in October 2011) that many bizarre events started to occur at Oakwood Park Recreation Center beginning in December 2011. Number one- Once the fences on Broadway were raised(LAPD requested that the fences be lowered to three feet, and the park benches removed about ten years ago because LAPD said it would give them easy access to people in the park who were doing illegal activity. The benches were returned after the Venice community had a meeting with Council district 11). Number two- the fence exits on Broadway and 7th Avenue and Oakwood Street and Broadway that have been there for over fifty years were closed. When the community let the Los Angeles City of Parks and Recreation know this was not working for the community, and especially the Seniors and handicapped. Number three- Then the trees were stripped not trimmed stripped of all their foliage, poor tree trimming job. Number four- Then this craziness with a year long project of and irrigation system comes out of the blue, and now the park is sealed off and completely closed for one year? Wow it all reaks of LAPD and Oakwood park director Ms. Lizka Mendoza working together closely to get the people of color out of the park. It appears when the other terrible ideas were put together and they didn’t pan out to what it was created for (to keep people of color out of the park). Park Director Ms. Lizka Mendoza decided to create this irrigation system project that would take a year to complete? This community is outraged by the games that are being played with the only park in the immediate area for our children to play in. Enough with the games about such a project get it done and reopen the park in March! Oakwood Park remains closed for refurbishing. The only open gate is in the play ground area that is never locked. Is this open area supervised during refurbishing ? What happens if a child is hurt inside the playground area without supervision when the Park is closed ? Who is responsible? The front door of Oakwood remains boarded up after numerous gun shots had blown out the windows. Might the $600,000 plus in Quimby funds given to Oakwood Park years ago, earning interest each year, from CD11 Bill Rosendahl be paying for this project? Who receives the “interest dollars” ? Are the Coastal Commission and the VNC Executive Committee aware of this project that began when the Director of Oakwood Park Lizka Mendoza kept postponing selection of a new Park Board. With no Park Board, the Director makes all refurbishing decisions with out community input. A CPRA was sent to VNC LUPC Chair Jake Kaufman to discover whether VNC has knowledge and/or are involved in this project that was never shared with community.Mr. Kaufman replied that LUPC has no documents concerning Oakwood Park. Based on advice from Mr. Kaufman, the CPRA was sent to the VNC Administrative Committee and incoming Secretary Kristopher Valentine. When Mr. Valentine notified this advocate that Joe Murphy is still secretary for a few more weeks, I sent Mr. Valentine a letter postponing the CPRA until he is installed as new Secretary in February. This was done based on Mr. Murphy’s cynical replies in the past denying CPRA requests against those who are accountable, transparent, and consistent. Might this CPRA expose the Barry Sander’s LA Park Foundation, a 501c3, taking over the park after a past board voted to deny joining Mr. Sander’s organization, which donates 50% of the funds collected to fund political campaigns? How can one person serve as President of the LA Parks and Recs Board of Commissioners while running an organization to take over the LA Parks under a 501c3? Finally, is the water fountain behind the backstop being replaced? Community asked this advocate to write of this concern where dogs drink directly from the faucet. The Venice Community needs Oakwood Park to return to the supervision by West Side Parks and Recs who play fair ball. This mess began when Oakwood Park was taken over by San Fernando Valley Parks and Recs under Interim Leader Charles Singer who has little concern of the Venice-Oakwood Community. 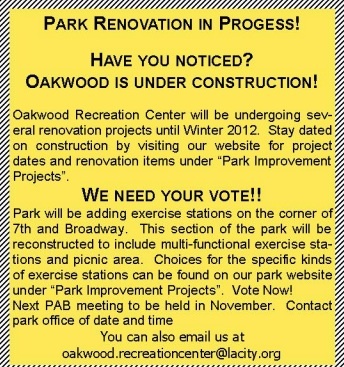 As stated below, Parks and Recs were requested to reply to the fences installed at Oakwood Park by December 27, 2011. These fences violate the rights of seniors and physically challenged to reasonable access to Oakwood Park picnic area which includes benches. No response was received from Parks and Recs. Based on the attached e-mails between Oakwood Park Director Lizk Mendoza and Community, one perceives that ” things are not fine ” at Oakwoo Park. Might it be time for a full investigation concerning : the $600,000 plus in Quimby Funds and where the interest earned has gone ; the shooting and the gun fire that shattered the windows of the Oakwood Park meeting room; the park field filled with feces and urine based on dogs running off leash and the lack of accountabilit by Management to keep dogs on leashes; the attempt to move or close the picnic area; the reason why outdoor exercise machines purchased with Quimby funds have not been installed. ” Management has shown lack of consideration to address the rights of the Venice low income, under represented minority community who sees these actions above as another effort by RAP Management towork towards the gentrification of the Oakwood Community. Why did San Fernando Valley Park Management make the decision to close at least twoof the four openings to access Oakwood Park with fences which denies reasonable accommodations to seniors and physically challenged ? ADA is more powerful than Valley Park Authorities and the Oakwood Park Director. Parks and Recs Valley Directors Charles Singer/ Mark Israel Bring In Four LAPD Police, CD11, and Park Police To Protect Them From A “Vocal” but “Peaceful” Venice Community. A special thanks to Interim Valley Superintendent Charles Singer, Valley Deputy Mark Israel, Outgoing Appointed Oakwood and President Cameron Rodriguez for their refusal to set up intervention regarding their allegations that community is out of control and were in need of Police Action at Oakwood Park for tonight’s Oakwood Park Advisory Board. Based on the denied intervention by new Valley Leaders, Community Comes Out In Numbers. Not one, not two, not three, but 4 LAPD Pacific Division Officers, Park Police Manny Aldana, and CD11, and Valley Authorities lined up standing like a barricade at the back of the meeting. As explained in the e-mails below, Park Director Lizka Mendoza and her appointed President Cameron Rodriguez contacted the Valley Authorities stating meetings in the past were out of control and Needed Police supervision. Tonight the Oakwood Community came out in droves to challenge the Board who threatened to remove picnic tables and benches that serve as a historic landmark at Oakwood Park for at least 50 years. Community Member David Busch was placed outside the meeting by police alleging that Park Director Lizka Mendoza made it clear to him that one of the picnic tables and benches would be placed in another area of the Park or removed altogether. Mr. Busch made his voice heard regarding Ms. Mendoza’s decision. Ms. Mendoza tonight changed her message to Mr. Busch stating she never made that remark. Mr. Busch explained emotionally that Ms. Mendoza “was lying”. The community made it clear tonight that they want none of the picnic benches and tables touched as this is an area where free speech is permitted for all community. Of the sixty or seventy in attendance no one from community wanted those picnic tables and benches moved in favor or “less than attractive” fitness machines. Community made it clear they want the fitness machines to be integrated in the Park’s infrastructure but not near the area of the picnic table and benches. The gentrification agenda of Mr. Rodriquez, Ms. Mendoza and her “Valley Boys”, back fired on them as their threat for police action brought out the community who were standing up for their rights. The threats by Mr. Singer, Mr. Israel, Mr. Rodriguez and Ms. Mendoza for police action did not scare the community, as they came out to challenge the gentrification philosophy of those mentioned above. Money! Money! Money!. It was made very clear by Director Mendoza and her appointed President Rodriguez that there was $614,816.93 in the Park Quimby Funds as of October 26, 2010. Mr. Rodriguez appeared “less than accountable” along with Director Mendoza when neither knew how much remains of the $614,816.93 and provided no budget for Oakwood Park. Was this money spent fairly? The Board and their new Valley Leaders Singer and Israel were clueless about funds causing more concern by the community. Why didn’t Ms. Mendoza nor Mr. Rodriguez introduce the new Valley Leadership , Mr. Singer and Mr. Israel. It appears the Valley Authorities did not want the community to know who they were ? What was sad was the fact that neither Mr. Israel nor Mr. Singer would comment about Park Policy allowing Director Mendoza to unilaterally continue to pick Board members and appoint the President. Community wants involvement in the selection process but are denied input by the new Valley Authorities. Why was Oakwood Park moved to Valley control? Mr. Singer continues to not abide to a CPRA requesting the memos concerning this change from Westside to Valley control. Might gentrification be the reason for his denial to share the documents? Lizka Mendoza and her assistant Eliaja Cooper continue to preach the philosophy that Oakwood Park is all about Recreation, not Education. Ms. Cooper did make mention that she and Ms. Mendoza are working with the Mark Twain staff, but provided no names of whom they are coordinating with at the school. Might Quimby funds be supporting this alliance between Mark Twain Middle and Oakwood Park? Strangely this alliance has never come up at any Mark Twain governance councils nor Friends of Mark Twain. I request Mr. Singer provide a statement regarding this Mark Twain- Oakwood Partnership that no council at Mark Twain knows about. Might this involve the submission of the Mark Twain Charter that no school governance has ever addressed? Is Ms. Mendoza, Mr. Singer, and Ms. Cooper part of the Mark Twain Charter Cabal who shares no information with the community nor parents,except for a few favorites? Ms. Mendoza stated this is the last Board Meeting until she unilaterally selects new members with the next meeting to be held in March, 2012. A special thanks to the Oakwood Community who came out tonight and let their “Voice” be heard. The Valley scare tactics were less than successful. Will all Oakwood meetings now include 4 LAPD Officers, Park Police, and CD11 lined up in a barricade ? At least a month ago, Interim Valley Parks Superintendent Charles Singer was directed by his Superiors to participate in intervention after Charles Singer shared the slanderous allegations against community by the unilaterally Appointed Oakwood Chair Cameron Rodriguez. Rather than participate in intervention dealing with the gentrification issue at Oakwood Park and the “less than fair play” by Oakwood Park Director Lizka Mendoza, Mr. Singer made a mockery of the process and ignored the Directives by his Superiors. Mr. Singer ignored the request for intervention stating he will meet with this advocate on November 1, 2011 one hour before the PAB Meeting. It appears Mr. Singer and Cameron Rodriguez orchestrated the slanderous remarks to allow chaos to occur. I share below a letter I received tonight by a leader in the African American Oakwood Community. Mr. Rodriguez continues his support of the Gentrification of Oakwood that he has participated in for over two years. I’m sitting at Oakwood park (3:14 PM) and people are out enjoying the day. There are lots of African Americans sitting out, on the park benches playing cards, dominoes enjoying there Monday afternoon. LAPD ( four officers) arrives circles the park a couple times then park and decide to go in. They walk up on a gentlemen who is sitting on the lamp pole in the middle of the park he stands up and two of the officers frisk him and he sits back down. All four of the officers talk with him for about fifteen minutes. I see them filling out a white card, a young lady arrives and the gentlemen gets up and leaves. The officers then walk up to the park benches and begin this process once again to some other African Americans sitting on benches in the park. These people get up after the officers are done and leave the park. I question this procedure always harassing the African Americans in the park and never ever stopping to question the people with dogs off leash, or the Sunday kick ball players with ice chests and coolers (drinking alcohol )attending the park? Why is it when African Americans or Latinos attend Oakwood park they are always, always bothered by LAPD? Why I could swear that having dogs off leash is against the law but yet they are never told anything? Drinking in the park is not permitted either but those kick ball players are never harassed. This violation is overlooked each and every time by LAPD. LAPD the law is the law uphold it, and do unto the dog owners and Sunday kick ball people what you do to the people of color all the time without hesitation harass them and fill out white cards with their information on it. Stock pile their names and descriptions and arrest them when you accumulate more then five. Be fair and do what is right Oakwood is for all people. OAKWOOD PARK PICNIC AREA UNDER ATTACK? Oakwood Park is supposed to be a great place to play sports, send kids to arts and culture classes, offer seniors a place to gather –or just do what generations have done there before: Come on out and have a neighborhood picnic in its friendly picnic area. But more and more now –this is only if you are the right color. Increasingly, the newly arrived forces who hide behind high walls, fences, and fancy remodels –want to call the police every time they see someone of color, or less than rich, having a picnic or playing dominoes in Oakwood Park on the picnic benches. Some of these forces include people –who come out and flaunt their disdain –and the privilege of their wealthy clique, by running scores of their dogs off-leash in this park daily: knowing that it is illegal. LAPD officers, in cahoots with their conspiracy, are blatantly ignoring their illegality. Meanwhile, they rush to cruise by and intimidate or interrogate people of color in the park. This is not something happening in Bull Conner’s Selma –this is the increasing reality in Venice –right now at our Oakwood Park. On Tuesday Nov. 1 the Oakwood Park Advisory Board will meet at 6:30 pm in the main building with a “plan”, which they say is to “add new exercise stations” to the Park –and which will, according to them, not “move” –but instead, only “relocate” these picnic benches. Benches that apparently (unlike some in the community) know no racial distinctions –and welcome all. Write a letter or email Jon Kirk Mukri <jonkirk.mukri@lacity.org> at Los Angeles Parks and Recreation now –to tell them that you oppose any attempts whatsoever to move, relocate or impinge upon the community picnic area in Oakwood Park. Tell your friends and join with our effort on Nov. 1 to stop this attack on all the community in Oakwood park. Contact us at: www.spiritofvenice.net for more info. THEY APPARENTLY HAVE DECLARED IN A VERY HARD TO FIND SPOT IN THE OAKWOOD PARK BROCHURE (see attached) THAT THERE IS A WEBSITE OUT THERE SOMEWHERE WHERE THEY ARE COLLECTING “VOTES” ON THE EXERCISE EQUIPMENT !!! On the first page of the brochure it mentions that for people to choose and vote on the exercise equipment they must go to the park website (which they don’t include) and click on “Park Improvement Projects” – I had to do a separate Google search to find the park website and here’s the link http://www.laparks.org/dos/reccenter/facility/oakwoodRC.htm – when I clicked on “Park Improvement Projects” it opens a one-page PDF which has no link to vote on equipment. According to Oakwood Park Director Lizka Mendoza, the next Oakwood PAB Meeting will be held on November 1, 2011 at 6:30 p.m. at Oakwood Park. Sadly, there will be only two Oakwood PAB Members still on the Board at that time as Cameron Rodriguez and Chantel Hunter Mao’s term ends October 15, 2011. Interim Valley Superintendent Charles Singer continues to avoid promised intervention between Park District officials, this advocate,and LA Human Relations focused on the issue of gentrification in the Oakwood Community. Mr. Singer, the Valley interim Superintendent ordered police to be present at Board Meetings after outgoing PAB Board appointed President Cameron Rodriguez reported the agendas could not be completed based on those who create “bad behavior” and deny agenda items to be discussed. What type of violent behavior does Mr. Rodriguez create to necessitate police at Board Meetings ? Why does Interim Superintendent Singer and his Deputy Marc Israel refuse to comply to PSRS requests and mail a copy of the Oakwood Park By Laws? Apparently more cover up. Although Mr. Singer realizes he has been given false facts (lies) by Cameron Rodriguez, Mr. Singer continues to stall intervention to occur. According to minutes from the last PAB Meeting on March 22,2011, the entire agenda was completed 50 minutes after it started. There was no bad behavior; only “Gaslight Behavior” by Cameron Rodriguez, who attempts to create chaos and promote gentrification. Why is Cameron Rodriguez being protected by Interim Valley Superintendent Charles Singer ? Why is Mr. Singer not playing by the intervention rules as set up by LA Parks and Recs and LA Human Relations? Why does the Interim Superintendent from the Valley stall the intervention process rather than create resolution and open the doors to collaboration? This very strange move placing Venice as part of the valley makes little sense. Was moving Oakwood Park in Venice outside of the Westside into the supervision area of the San Fernando Valley Interim Superintendent Charles Singer a purely political move? Please send all paper work verifying Oakwood Park was moved from a Westside Park under Superintendent Sophia Pina Cortez to a Park now under the Authority of Valley Park Interim Superintendent Charles Singer and the reasons why. As well, Ms. Mendoza put out a less than clear bulletin regarding “an on-line vote for the community” concerning exercise equipment. Why has this voting item never been placed on a PAB Agenda? Many in the community are low income under represented minority who do not have computers. Again, this is just part of the Rodriguez, Mendoza, Singer gentrification agenda. ” On the second page of the [Oakwood] brochure it mentions that for people to choose and vote on the exercise equipment they must go to the park website (which they don’t include) and click on Park Improvement Projects” – I had to do a separate Google search to find the park website and here’s the link http://www.laparks.org/dos/reccenter/facility/oakwoodRC.htm – when I clicked on “Park Improvement Projects” it opens a one-page PDF which has no link to vote or any other pertinent info. re: choice of exercise equipment. Please set a date for intervention before the November 1, 2011 PAB Meeting which at that time will have two active members. Again, please send the by laws as soon as possible. As each day passes, it appears Valley Interim Superintendent Charles Singer continues to cover up and stall intervention agreed to by Parks and Recreation and Human Relations based on slanderous comments made by appointed Oakwood Park President Cameron Rodriguez that moves into month two. 1. 4th request- Please send a copy of the Oakwood Park Advisory Park Board By Laws. 2. 2nd Request Was moving Oakwood Park in Venice outside of the Westside into the supervision area of the San Fernando Valley Superintendent Charles Singer a purely political move? Please send all paper work verifying Oakwood Park was moved from a Westside Park under Superintendent Sophia Pina Cortez to a Park now under the Authority of Valley Park Interim Superintendent Charles Singer and the reasons why. 3. Has Penmar Park in Venice also been moved from control by the Westside to control by the Valley? Peace. As one who believes in conflict resolution to improve the quality of life for the whole, I am concerned why Parks and Recs Valley Superintendent Chuck Singer prefers to stall the intervention process regarding the slanderous statements made by Oakwood Park appointed President Cameron Rodriguez to Mr. Singer to create “community chaos” and preserve a gentrification agenda opposed to education for the low income under represented minorities in the community. Rather than deal with the issues, Parks and Recs appear to prefer anger to prevail. As I have had a long talk with Sheldon Cruz ten days ago and take the words of Westside Superintendent Sophia Pina Cortez as both “Gospel” and “honorable”, I am bothered what is holding this process from occurring. Why does no one share the Oakwood By Laws? I have no option but begin to open boxes and look for my copy. Rather than continue to play middle school “Gaslight” games, might we please hold this meeting(s) to clear the air. I accept the fact that information given to Mr. Singer was less than fact. This is LAUSD and CD11 Politics at its ugliest. (“Gaslight” tactics ). All I seek is fair play, promised intervention and honesty for the whole community; not just a chosen few. Was moving Oakwood Park in Venice outside of the Westside into the supervision area of the San Fernando Valley Superintendent Charles Singer a purely political move? Was Penmar Park and Mar Vista Park also moved to Valley Supervision or was Oakwood an isolated situation? Communication is best to clear up mis-communications, you have the right to label what I wrote as false and misleading information. My questions were specific and you failed to answer them. I do recall as being a former PAB member, per the bylaws that PAB members end their term on a calendar year and not in the middle of the year/month. However I seem to recall a great delay with interviews and the entire process taking very long. I will be requesting the information and documentation from you regarding this matter. That’s great if Mr. Rodriguez and Ms. Mah end their term in December of 2011 because that means that there may be PAB meetings with a quorum and no reason to delay other park related issues and community concerns being addressed. As far as ‘fabrication for the date October 15th’, that remains to be seen and proven. “As for the rest of the PAB members, I will determine how many members I must replace after our final PAB meeting of the year.” I think this would be a good time to address the major responsibility the policies and the by laws that allow one person, the park director, to create and build the PAB for city parks. The PAB election and election process at Oakwood Park should be- a community process, after all look at the recent crimes of pedophilia in our neighborhood, Liska. When will you be doing interviews as Cameron Rodriguez and Chantel Mao term ends this October, to be more precise the 15th of October. Pastor Allen and the student, whose name I cannot recall, have missed three consecutive meetings. Per the by laws, they are supposed stepped down or were their absences excused by you? Richard Henry is no longer with Greendot and lives in another community. So how many empty seats is that? The only two who are on the Board after Oct. 15 is Ms. Navarro and Mr. Eddie Dabs and that is not enough for a quorum. Call For Safety Plan For Campers, Seniors and Those Who Use Oakwood Park. Why No Emergency Meeting of Oakwood PAB Board ? Board only deals with sugar and spice issues. Discussion of neighborhood safety inside the park has seized with a Board that appears hand picked from CD11 to make sure everything appears on the “Happy Channel”. I write you with the concern regarding the safety of the children and seniors who attend the park; many who witnessed the shooting of seven shots into the park in broad daylight on the Sunday before Memorial Day. According to witnesses, a Hispanic male between 25 and 30 jumped out of a black car with tinted windows at 7th and Broadway inside the gate opening not far from the picnic tables and fired seven shots into the park. Fortunately no one was hit but there were sure a lot of scared kids and adults. The statements yelled by the shooter will not be shared in writing as these remarks expound more hate and violence. On Tuesday May 31, 2011, I spoke with Captain Jon Peters who informed me the police were working on leads. On Thursday, this advocate was contacted by Pacific Division. I thank Captain Peters for following through. What is the Oakwood Director and her assistant Asia doing to protect the children and the seniors ? The shots were fired inside the park. Why is the unilaterally appointed Board and the appointed President not holding a community meeting to discuss safety and security? Will the children inside the Oakwood Park Summer Camp be safe ? Before I request by CPRA a safety plan by the Oakwood Park Director and her Board on how children and seniors will be kept out of harms way, I request you send me this safety plan before 5 p.m. June 10,2011. Again rather than having the Assistant Director Asia preaching the gospel of how wonderful everything is at Oakwood Park at a gathering with LA Pacific Division, let’s make sure a plan is developed together as a community rather than unilaterally by Ms. Mendoza, Asia and her CD 11 approved Park Board. I appreciate anything you might do to secure this safety plan. On Tuesday, May 24, 2011, Director appointed Oakwood Park Board President Cameron Rodrigues and the six Director appointed Board Members approved an estimated $120,000 of tax payer dollars in Quimby Funds to refurbish two restrooms. 1. Please send all bidding quotes for the refurbishing of the two Oakwood Park washrooms. 2. Please send verification of the company chosen to do the refurbishing. 3. Please send a line item receipt for both washrooms which will be completed by July 4,2011. 4. For several years, Oakwood has had $614,000 in Quimby Funds. How much of the interest on these funds are returned to Oakwood Park and if these funds do not go to Oakwood Park where specifically does this interest income go ? Please send a copy of that account, if it exists on paper. CD11 Alleges Executive Director Olga Garay of LA Cultural Affairs Was Less Than Honest With VNC Member and Educational Advocate ~ Is It Time For An Investigation Into The Wesson-Hahn 3-18-11 Motion? On April 12, 2011, in a letter below, you shared with me and a board member of the VNC that you and your Assistant General Manager Saul Romo met with Arturo Pina, a deputy to Council Person Bill Rosendahl who asked you to help him out to allow the Vera Davis McClendon Center to be moved out of CDD into LA Cultural Affairs. As I wrote you, this meeting was taped so errors would not occur in quotes. When we spoke on April 12, 2011, you informed me and the VNC Board Member that Arturo Pina informed you and Mr. Romo, “The goal was to permit Venice Arts to take over the management of the Vera Davis Center”. Tonight at the VNC Meeting, this topic was discussed. I had the opportunity to question Mr. Pina. I asked him if the statement you stated he made above was true or false. After attempting to avoid answering, he stated you did not state the truth. On the other hand, Mr. Romo stated he could not recall what was said. A copy of the tape is available. All this community wants is fairness and honesty. Tonight’s meeting was a disappointment after speaking with you and hearing fact. The truth you shared with us needs to ring. Many on the Board were shocked when they found out that a certain portion of the board knew about this change for several years and certain board members knew nothing. This came out when acting President Carolyn Rios, who has been stating she knew nothing of any takeover of Vera Davis, later admitted many on the Board were well aware of this takeover for several years. When former Board President Mike Newhouse spoke in favor of Venice Arts, someone in the audience yelled out that his speaking as a Board Member regarding Venice Arts was a conflict of interests as he is on the Board of Venice Arts and VNC. Mr. Newhouse left his seat and took the discussion outside the auditorium and got into a heated discussion with about a half dozen from the community. When he asked one community member if she would prefer to see Vera Davis closed or run by Venice Arts, the community Member responded, “Close it”. Finally, it was explained that under Cultural Affairs, only those organizations who deal with the arts would be able to remain on the premise. This upset many. What would become of the wonderful services now being provided and those who have already been forced out? It took a Hispanic leader several minutes to make a commentary in Spanish that few understood as there was no translation. If the schools can provide translation, why can’t the neighborhood councils ? CD11 has been successful to keep the deep division brewing why they do whatever they want, whenever they want, with no one looking, because the people are fighting among themselves. United we stand ,divided we fall. VNC and CD11 must look inward and realize it is time for introspection. Are you there for ego, self interests and POWER, or are you there for the people? Why Was VNC Left Out of the Vera Davis “Oligarchial Coup”? She shared with this advocate that she was approached about two months ago by Council Member Bill Rosendahl while she was on other business before the City Council in regards to the Vera Davis Center being included as number 15 in an RFP process which the Cultural Affairs Department was working on with the COA for 14 art and theatre centers [Family Source Centers] in the City of Los Angeles. According to Ms. Garay, at this meeting, Deputy Pina stated ,“The goal was to permit Venice Arts to take over the management of the Vera Davis Center”. Why was there no discussion nor advertisements for other organizations currently operating at the center to apply to operate this center ? Was( Is) Venice Arts the only organization who has applied for the management of the Vera Davis Center, and if so, why was this opportunity to apply not shared with the Venice community when the motion was passed? What will be the yearly budget be of Venice Site 15 of Cultural Affairs and will the name Vera Davis McClendon remain the name of Site 15? Who will control that budget? Ms. Garay did not have the answers. Why was no one from the Venice Neighborhood Council ever informed about this “political oligarchial coup” until at least a week after passage ? Why is the Vera Davis Center being pulled out of the RFP process with other Community Centers that are not part of the original 14 Family Source Centers currently in place? the RFP contract and receive a 5 year contract plus a possible 5 year extension. Why did Mr. Pina speak on the behalf of Venice Arts as RFP? Why was the Wesson-Hahn motion regarding the Vera Davis Center not written by you, the Councilperson whose area includes Vera Davis? This is an official statement from the office of CD 11. I received this today, Friday, April 8th. It is the intention and goal of Councilmember Rosendahl, the Community Development Department, and the Department of Cultural Affairs, to keep the VDC operating and open to the public, with a wide variety of services offered to the community. We are working dilligently on means to keep the center operating until a Request for Proposal for an operator to manage the VDC and all such City-owned facilities is released, a contractor is selected, and the recommended contractor is approved by Council and the Mayor. That process will be open and fair to all responding agencies. Management of the VDC is planned to be transferred to the DCA on June 30, 2011. There are no plans to close the VDC. We are reviewing all options and strategies to accomplish these goals. All interest members of the Venice Community are invited to attend a meeting of the Venice Neighborhood Council on April 26, 2011, at 7:00 p.m., at Westminster High School, 1010 Abbot Kinney Blvd. The plans for the VDC will be discussed at that time. Representatives from CD 11, the Community Development Department, and the Department of Cultural Affairs will be present to answer questions. Cliff, you may disseminate this information to the tenants as well. Please refer questions to me or to Arturo Pina. Thank you. I can be reached at: 310 305-7996. I have read the motion by Councilperson Wesson and seconded by Councilperson Hahn, to eliminate the Venice communities, ” Vera Davis Center”. Ms. Garay has shared these documents above with budget analysis and spread sheets. Again from the “amount” of paperwork Cultural Affairs sends, how was it possible for no one in Venice to have any knowledge of this motion until two days (3/29/11) ago ? It appears VNC and Neighborhood Councils have little significance to CD11 and the two who made the motion as to what “goes down” with Venice History. It appears Cultural Affairs were also either “innocent” or “ignorant” as the VNC Board (see letter below from Carolyn Rios) also were totally unaware of other positions on this issue. Imagine the surprise to those who count on the services they receive from programs within the Vera Davis Center. Part 37 of the motion states: Authorize the General manager, LAHD [ Donald Guthrie ], who does not receive e-mail, or his designee, to negotiate and execute a contract with the most qualified contractor selected to provide urgent repair construction services for the UPR in an amount not to exceed $100,000 for a nine month period to commence on April 1, 2011 subject to the City Attorney as to form and the Department of Public Works, Bureau of Contract Administration, as to compliance with City and federal contract requirements. Ms. Garay, please inform me which contractor has received the $100,000 contract that begins tomorrow for reconstruction of the Vera Davis Center. Finally, this community has seen far less than fair play from “LA Housing General Manager Douglas Guthrie and the Assistant General Manager Helmi Hisserich. I cannot understand why Councilperson Hahn, who is running for Congress in this area, did not want this information shared with the people in Venice before construction begins apparently tomorrow with $100,000 of tax payer dollars? The people of Venice need immediate answers before the hammer bangs down the walls at Vera Davis. The people of Venice deserve answers. Please send a copy of the less than or equal to $100,000 contract given to the most qualified contractor and how this contract was advertised. This advocate truly appreciates your involvement in this urgent matter. Please include the item involving PPP’s below to be placed on the 2-22-11 Oakwood Park PAB agenda. You still have not replied to my e-mail regarding the PAB that you appear to not want to focus on. leave off the agenda. This is not about personality, but about what is best for kids and seniors and the community. Please be kind enough to drop the “ill-will” you have demonstrated in the past and place these items requested on the agenda. If we all do not work together, the kids lose. Rick Selan___________________________________________________________________________IMPORTANT! – SHARE WITH OTHERS! SUBJECT: THE SELLING OF CITY NEIGHBORHOOD PARKS. “The city of Los Angeles has been battling over billboards for years. Now the debate over advertising is spilling over into park space. Correspondent Brian Rooney investigates whether or not the city is selling public park space to advertisers. CALL YOUR COUNCILMEMBER AND PROTEST WE DO NOT WANT OUR CITY PARTS TRASHED. BRING A CAR FULL TO MEETING WITH YOUR FAMILY MEMBERS, FRIENDS, NEIGHBORS AND CONCERNED CITIZENS. SEND THIS MESSAGE TO YOUR EMAIL NETWORK. FYI – SHARE INFORMATION ON CLOSURE OF CITY PARK RECREATION CENTERS WHICH MEANS CLOSURE OF CITY PARKS. THIS EMAIL IS NOT AN ENDORSEMENT OF THE PLANS AND AGENDA OF THE “LOS ANGELES PARKS ALLIANCE.”, NOTE FOR INFORMATIONONLY. IS YOUR NEIGHBORHOOD CITY PARK RECREATION CENTER NEXT? WHO WILL BE IN CHARGE OF A CITY RECREATION CENTER IN THE FUTURE AND WHO WILL CONTROL ACCESS TO A CITY PARK AND OTHER PARK FACILITIES. ASK QUESTIONS AND CONTACT YOUR CITY COUNCILMEMBER TO PROTEST CLOSURES. I would like to introduce myself to you. My name is Karin Fox and I am the new director at Rose Hill Recreation Center. I wish I could be making this introduction under better circumstances, but there is a pressing issue which I must introduce to you. There is a proposal under consideration which would effectively remove all recreation staff from Rose Hill Recreation Center as well as many other centers around the city. This includes Ascot Hills, Hazard Park and Ramona Gardens. I am reaching out to you today as council members of LA 32. The Los Angeles Parks Alliance is holding a workshop which is scheduled for this Saturday, February 12 from 12-3pm, in which community stakeholders such as your self will be given more information on the situation and will work with facilitators who will provide tools to help. It is my hope that you will attend this meeting and represent Rose Hill Recreation Center. I have attached the flyer for this event in both English and Spanish. I sincerely hope that I will see you all there. If you have any other questions about this event, please feel free to contact me at the park office at (323) 225-0450. Re: Who Used The Name and Title of Laura Island To Share False Facts With Yo Venice? Why Is CD11 Participating in Creating Havoc and Chaos at Oakwood PAB? I have met with Assistant General Manager Kevin Regan on October 8,2010 regarding the Yo Venice posts regarding the upcoming Oakwood PAB Meeting.He was in total agreement that the RV issue in the Oakwood Community does not belong on the agenda for the Oakwood PAB Board for October 26, 2010. I feel an investigation is necessary to discover who used Laura Island’s name and title as Mr. Regan explained that according to Ms. Island she never spoke to anyone from Yo Venice regarding this non-PAB agenda item as this is not a PAB Board Agenda item. As far as CD11, this appears as more Gaslight tactics by the Rosendahl organization to create divisiveness in the community to promote more battles between neighbors so CD11 might remain less than accountable while they apparently will select VCHC / POWER to operate the RFP program to set up night housing for RV’s. More taxpayer dollars to their friends. I appreciate your response and I would like to say that I was informed that Mr Regan has stated the Park Advisory meeting will not be talking about the RV issue at the meeting on October 26, 2010. Im very pleased that this will not be a meeting where this discussion will occur because Recreation should be the focus for the Park Advisory meeting. May I suggest that you inform Yo Venice that this issue will not be on the October 26, 2010 agenda because it is all over the community about this meeting being a forum for getting homeless signs hung up on 7th Avenue. Again thank you for your response and time concerning this matter. 1. there was improper notification to the surrounding residents and the VNC and lack of follow through. 3. Failure to comply with VCZSP,particularly for the Oakwood sub-area. CD 11 ignored VNC and all the letters and calls from Oakwood residents and officials went unanswered. Please share copies of this e-mail with all Coastal Commissioners involved in our Venice Beach community. Mr. Selan – The Coastal Commission has no application, permit, or any other type of authorization relating to a cell tower in or near Oakwood Park. I do have a copy of a January 22, 2009 letter from Venice Neighborhood Council to Bill Rosendahl relating to a cell tower next to Oakwood Recreation Center. I also have a November 25, 2008 email that discusses the permit requirements for a T-mobile site at 7th and Broadway in Venice. In November 2008, I also rejected a Request for Exemption for a T-mobile project proposed at 7th and Broadway in Venice. Please let me know if you want copies of these documents, and you may send photographs, a site plan (with address of tower), and any other relevant documents if you would like our office to investigate the matter. “Ubi Ignus est?” 1615 Glyndon Ave.
Lizka Mendoza, Oakwood Park Director, has been unable to produce the Oakwood Municipal Account nor any of the funds surrounding Oakwood Park. Ms. Lizka, as she prefers to be called, has refused to discuss or to reply to where $75,000 in Oakwood Park Venice Surplus Funds are located, if they still exist. Ms. Lizka and her Senior’s President Zelda James were successful in forming a coup of three Board Members who favor the gentrification of Oakwood and who ask no questions regarding the alleged cover up of funds. Ms. Lizka and the gentrifiers pretend everything financially is up to par but refuse to reply to financial questions and pretend the concerns are bogus. Ms. Lizka, will have beginning November 16, 2010 a 3 member Board who can not vote as there will be,no quorum. While the gentrifiers have the understanding they can do no official business until at least four new members are unilaterally selected by Ms. Mendoza, they refused to make a motion, upon request by community for unity, to allow the Board to remain whole until the new Board is in place as it took Ms. Lizka over a year before she unilaterally selected the three gentrifiers in October, 2009. Ms. Lizka’s plan is to bring back the RAND corporation and PPP, the public-private partnership of Parks which the current Board rejected. Ms. Mendoza was in seventh heaven as she will be able to continue her alleged money laundering and strategies of privatization with no one asking questions as she personally selected gentrification candidates Attorney Chantel Hunter Mah and UCLA Student Cameron Rodriguez who grew up in Oakwood but never went to Venice Schools nor played in the Oakwood Community nor with Oakwood youth according to community elders. The third gentrification member Jill Prestup, again for the fifth month, never showed up. While Ms. Lizka never mentioned Ms. Prestup, gentrifier Cameron Rodriguez told those in the first two rows that Ms. Prestup resigned. Might this be more “Gaslight” by gentrifier Rodriguez and Ms. Lizka? Ms. Lizka continues to deny Community Member Kendra Moore her Board Seat which Ms. Lizka unilaterally took from here while Ms. Moore was ill. The third member of the Board who will remain is Jataun Valentine who was given life membership by City Council Member Bill Rosendahl. Ms. Lizka stated that with the Rand Corporation as partner, Rand will donate exterior “exercise machinery” for community. She failed to mention that her gentrification members also favor PPP where half the donated funds go to Oakwood Park and half to political contributions. ( Might these funds go to the Sarah Palin Tea Party or to the future of Private Parks in LA? ) As Ms. Lizka will not begin her unilateral selection of new Board members until early next year, the next Board Meeting where official votes might occur might not happen until next fall given the time it took Ms. Lizka to unilaterally select her current gentrification selections. Ms. Chantel, as referred to by Ms. Lizka, was quite concerned about dogs off leash at Oakwood drinking out of the public water fountains.When this advocate explained that all Oakwood residents can buy a permit for $16 for a year to use the beautiful Santa Monica Dog Park a mile away, Park Police stated many could not afford the $16. Of course the low income under represented minorities might have trouble with the extra $16 dollars, but this sum is a drop in the bucket for the Oakwood gentrifiers who take control November 16. Ms. Lizka announced Oakwood Park has been sitting on $614,816.43 in Quimby funds, different from funds received from Venice Surplus funds, since July 9,2008. A CPRA Request wil be made below to find where these funds are located and the kind of interest being earned on these funds and where the interest is going. While Mark Twain Middle School has an after school program with tutoring for free with over 40 students, Oakwood has only 29 in their after school program as they charge parents and provide no tutoring nor educational assistance. Ms. Liska’s philosophy on Oakwood Park is that ” Oakwood is all about Recreation, not Education”. On Friday, October 8, 2010, this advocate will meet with City Park Officials regarding a LA Park Investigation into the the location of the funds, if the funds are still there, of the Oakwood Municipal Account, the Venice Surplus Funds awarded Oakwood and Penmar and Driftwood; the $614,816.93 sitting in Quimby Funds somewhere for over two years earning interest; and the title of the property for Driftwood Park being given to Parks and Recreation apparently as a gift. The gentrifiers were not interested in writing a letter to various security companies in the community to install cameras in the Front Hallway for the safety and security of the children and the seniors. Sadly,laziness was written all over their faces. Beat the People. Tonight was a sad night in the history of Oakwood Park. 1. Please provide an accounting of the $614,816.93 in Quimby Funds allocated to Oakwood Park approved on July 9, 2008. Please provide the amount of interest paid on these funds and the location of both the interest as well as the $614,816.93. Money is constantly discussed at Oakwood Park but improvements do not happen. 3. Failure to comply with VCZSP, particularly for the Oakwood sub-area. Please send copies of this full e-mail to all Coastal Commissioners involved with Venice and Marina. Please send copies of all documents per your letter below and please inform me where I might obtain the site plan through CPRA. Pictures will be sent by a community volunteer who made the offer last night. Dysfunction At Oakwood Park Board Meeting As CD 11 Continues $ 107,900 Cover Up With More “Less Than Factual Statements”. What happened to $614,816.93 in Parks and Recs Venice Quimby Funds ? Oakwood Park Director Lizka Mendoza continued to divide the Oakwood Park community and PAB Board to allow her to continue to work with VNC, CD11 and those organized to gentrify Oakwood Park. To demonstrate her disdain for the nearly one full year of work of the Oakwood Park Agenda Subcommittee , Ms. Mendoza unilaterally” dissolved the committee only to create a “unilateral subcommittee of her own” where she stated community is no longer able to attend nor participate. I ask you, Mr. Regan, to explain to Ms. Mendoza that all meetings and sub-committee meetings of the Oakwood Park Board are open to the public. This next new subcommittee meeting is to occur on 8-17 at 10:30 am. More obstruction was created as Ms. Mendoza, who took minutes at the April 27, 2010 meeting decided not to write them up for the meeting tonight. When asked why, she just smiled and said “thank you”. A copy of this advocate’s April minutes are at the end of this e-mail. While the agenda subcommittee sent in tonight’s agenda 48 hours before the meeting because of serious illness by the Chair, two sets of agendas were on hand for this meeting. One agenda was unilaterally written by Ms. Mendoza and one was written by the subcommittee that Ms. Mendoza stated she eliminated at the last April meeting but had no minutes to validate her statement. It took over 40 minutes for “the Board members present” chosen by Ms. Mendoza “unilaterally” to come to agreement with the other Board members on an agenda that would be used. Ms. Mendoza spoke of the promised security system; the need to fix a beam in the gym that has fallen; a new roof and outside sports equipment that was to be ordered with $614,816.93 in Quimby Funds allotted to Oakwood Park two years ago. Both Ms. Mendoza and CD11 had odd looks on their face when it was discovered that not a penny of these funds have been touched or has the money vanished into thin air like a lot of money in CD11. Why does Ms. Mendoza never share any budget with the PAB Board? Is she instructed by her directors not to? I am not sure? Where is the money, Mr. Sanders and Mr. Rosendahl. On April 16, 2010, the City Council approved of a motion by CD11 Rosendahl and Councilmember Parks ( Substitute- Item 62). This motion gave $237,000 to Penmar Park and $ 182,900 to Oakwood Park. Strangely 4 days later, Mr. Rosendahl, seconded by Mr. Parks, had the above amendment changed( #51) giving Oakwood Park only $75,000. Tonight, rather than Ms. Mendoza answering the concern, CD 11 Arturo Pina explained that Oakwood was only to receive $75,000 and the original amount of $175,000 was a clerical error as there was no “1” before the “7”. He became tongue tied when it was shared with him that the original amount given Oakwood was $182,900 and not $175,000. He did explain that Penmar Park still has their full $237,000. He could not explain why Oakwood Park lost $107,900. Might you Mr. Regan or Mr. Sanders? Is there any wonder why Parks and Recs are pleading poverty. No one seems to know where the funds are ? As far as funds, at the last Oakwood Park meeting in April, a community member donated $100 so the community kids could have a graduation party at the park because there were no other ways to raise the funds. According to Ms. Mendoza, the graduation party was never held and Ms. Mendoza unilaterally approved $60 of the $100 to be used for someone’s birthday party. The Board voted to return the other $40 to the donor. A letter is being written before 5:00 p.m. June 30, 2010 by Cameron Rodriguez for a permit for the Venice Bull Dogs. As Mr. Rodriguez refuses to share his phone number or e-mail with other Board members, it is up to Lizka Mendoza to decide if other Board members might have the right to comment on the letter before it is sent. The Board overwhemingly decided that it is important for the younger children to practice football and have cheerleading at Oakwood Park rather than make the little children travel to Penmar. Mr. Rodriguez, a “unilateral member chosen by Ms. Mendoza” walked out in the middle of the meeting after making less than kind comments about the effectiveness of the Board whose meetings he attends only when he feels like it. He continues his fraternity type college behavior by referring to community as jerks and jerkees. Zelda James, made a motion to remove Chantel Hunter Moi and Jill Prestup from the grantwriting and fundraising committees as she stated they seldom come to meetings. Ms. James moved to have Lydia Ponce take their place. Ms. Mendoza has obstructed the first meetings of these committees for 9 months. The committees, now led by Ms. Ponce, will meet either July 14 or July 21, 2010 at 6:00 p.m. Who is directing Ms. Mendoza to serve as the obstructionist? Park Police explained “dogs off leash” is no longer a problem at Oakwood during the morning or during daylight hours. Those who break the law with “dogs off leash” now come out at night. Ms. Mendoza spoke about a neighborhood youth that was incarcerated. She stated the youth had asked her for help. She asked community to help this child because her position makes it impossible for her to get involved. It was an unusual request as it was not on the agenda and the nature of the crime(s) were not clarified. Something about this needs more investigation as again there is more going on here than what appears on the surface. The meeting concluded with a summary of the Community survey taken at the VNC Elections in early April. At the VNC Elections, the Oakwood Park PAB Survey Committee provided surveys regarding Oakwood Park to those who voted. A key question focused on rating the Oakwood Park Director on a scale from 1 -low to 5-high. Of the 59 responses of those who knew the Park Director, 34% of those who responded gave the Director the lowest rating while only 20% gave the Park Director the highest rating. As far as Park staff, of the 69 responses of those who knew the Park Staff, 7% gave the Park staff the lowest rating while 42% gave the Park staff the highest rating. As far as the Oakwood Park Board, of the 50 responses who knew the PAB Board, 12% gave the PAB Board the lowest rating and 34% gave the PAB Board the highest rating. As far as attending a PAB meeting, of 139 responses, 22% have attended a PAB meeting and 78% have never attended a PAB meeting. The central question focused on what process the community feels is best for selecting future PAB members in 2011. Of the 84 who had an opinion, 7% of the community wants to keep the current unilateral selection process of having the Park Director make the decision. 27% of the community would like to see PAB members and the Park Director choose new members collaboratively. 65% of the community would like to have an Oakwood Park community election on selecting a committe to choose PAB members with the Park Director. This is the rationale for community joining together to challenge the unfair selection of Oakwood Park Board Members. If you wanted high tension drama that would keep you at the edge of your seat as passions soared, the divided Oakwood Park Board met on Tuesday April 27, 2010 in what might be described as a combination of One Flew Over the Cuckoo’s Nest, Lord of the Flies and 1984. Big Sister and/ or Nurse Ratched (dressed as the Oakwood Park Director Lizka Mendoza) sat far in the back of the room so she could not be seen unless the audience turned around. In an angry aggressive tone, Ms. Mendoza attempted to control the Board throughout the evening from behind, after organizing her “unilaterally selected members” before the meeting pushing a gentrification agenda. In the front of the room was Sergeant at Arms Zelda James who informed members in the audience to “SHUT UP” and then began calling members in the audience, “nuts”. She did not specify type of nut. Gentrification Member Cameron Rodriguez ( unilaterally selected by Lizka Mendoza) informed members in the audience that he would have them removed because he will only address Board Members rather than community members. To the best of this advocate’s knowledge, Mr. Rodriguez, in his seventh month on the Board, has done not a thing with the Board nor participated in any projects. He is on the Director’s call to intimidate those she is unable to. The other gentrification member “unilaterally selected by Lizka Mendoza” is Attorney Chantel Hunter Mah, who rather than participating in any Park Board activities put on by the Park and Board, complained of being harassed by a member of the community. She would give no specifics as this appeared all part of the planed “Gaslight strategy” by those discussed above before the meeting. The third gentrification member “unilaterally selected by Lizka Mendoza” Jill Prestup had a serious medical emergency according to Ms. Mendoza. At the last meeting gentrification member Jill Prestup walked out of the meting after 20 minutes because the gentrification members’ coup to make “gentrification member” Cameron Rodriguez President back fired terribly. The other Board Members are Fred Grant, President ; Lydia Ponce, Member and former Co-Secretary ( resigned as co- secretary after other Co-Secretary Jill Prestup refused to do any work whatsoever) and Jataun Valentine who is a lifetime member of the Park Board as designated by the CD11 Council Member. These three members carry the Board. Zelda James, Sergeant at Arms, is similar to the political candidate who goes with wind change. She is both disrespectful and has no business being Parliamentarian and Sergeant at Arms. Nevertheless, Senior Member James does come for lunch to the park each day and participates with other seniors. Based on this dysfunction and the fact that these serious conflicts began after Ms. Mendoza “unilaterally and politically” selected her gentrification candidates denying “unilaterally” LA Human Relations the right to sit in on the interviews , the community decided to work with RAP to change LA Park and Rec policy to create fair play in the selection of new Board Members in 2011. Ms. Mendoza stated those attempting to change Park Policy were giving others a sense of false hope. Community reminded her we still, outside of Oakwood Park, live in a democracy, and the people have the right to challenge policy that is both unfair and politically incorrect in a time of accountability and reform. All Ms. Mendoza has to do is to look at the Oval Office and think of those who alleged our President was giving America a sense of false hope. It is time for change in LA Parks and Recs. 1. Oakwood Park Director Liska Mendoza could not explain why $107,000 was removed from the $182,900 allocation from the Venice Surplus Real Property Fund given to Oakwood Park for their after school program. While Oakwood Park was left with only $75,000, Penmar Park kept its full allocation of $237,000 for its after school program and pre school care. Might this be based on lack of accountability and transparency ? Lizka Mendoza spoke of the large scale student summit Oakwood Park held in April bringing in NYA, VCHC, SPARK, and other non profits. When community asked Ms. Mendoza for a copy of the agenda and the summary of that program and the reasons no one from the PAB Board knew anything about this, she stated there was no agenda nor program nor summary. She stated there is no real need for Oakwood to have an after school tutoring program as the non profits have them. Might this be why our Middle School has a math proficiency at 17% and English proficiency at 30%. Might this be why LA BRIDGES VCHC failed at Mark Twain because there is no accountability nor transparency to help the low income under represented minorities? The non profits have no accountability of student performance nor any data based information to support their credibility. Might have CD11 felt Oakwood Park did not have the leadership for this $170,000 funding? On April 20, 2010, Mr. Rosendahl ( seconded by Mr. Parks) presented a new motion to the council (#51) to be added to the agenda at the next Regular Council Meeting to amend the motion to change the funding for the “Oakwood Rec Center from $182,900 to $75,000 with no reasons being given. Why? 2. The three “unilaterally selected gentrification members” refuse to share their phone numbers nor e-mails with the other members of the Board. Ms. Mendoza insists all e-mails must go to her instead to members so she can monitor all e-mails being sent out. Might this be Big Sister watching you? Ms. Mendoza does not want to accept the fact that she has lost the trust with at least 3/7 if not 4/7 of the Oakwood PAB Board. 3. Ms. Mendoza refuses to seat Board Member Kendra Moore stating she did not follow procedure for “illness leave”. Public records indicate Ms. Mendoza can find no records nor minutes indicating her allegations about Ms. Moore. 4. A projector and screen supposedly for the seniors bought from an application to VNC not going through Park procedures in December, 2009 has still not arrived. VNC has not replied to a CPRA regarding these funds and the application sent to this advocate from a CPRA through LA Parks has no signatures. VNC Treasurer Hugh Harrison and Oakwood Park Director Lizka Mendoza have not replied to CPRA requests. Why did no PAB member know of this application nor why the sent documents had no signatures. Where is the money or the purchased items? 5. PAB Board Member Lydia Ponce expressed concern why Lizka Mendoza and her assistant intervened and stopped the Black History month celebration before the Minister gave his speech as Ms. Mendoza began to remove chairs and collapse tables making a scene upsetting the audience and PAB members present. This was disrespectful to the African American community and Ms. Mendoza still has not apologized. 6. Ms. Mendoza was unable to explain what has happened to the large allocation of Quimby funds given to Oakwood Park nor was she able to explain if any improvements were made to Oakwood Park or if funds still remain. Is it any wonder CD11 took $170,000 from Oakwood Park or did Ms. Mendoza agree with CD11 to use these funds for OPD’s or for studies for an Oakwood Dog Park ? Might this be the will of “the unilaterally selected gentrifiers” ? Why are there no answers? 7. There is continued use of alcohol being used at Oakwood Park by the kick ball players who torment the elders who play dominos. This was witnessed by 1100 voters who voted at a VNC election on April 11, 2010. According to PAB members LAPD refused to intervene. No tickets were given nor incident reports written up. Ms. Mendoza was at the park for the election and chose not to intervene. At the meeting, gentrifier member Cameron Rodriguez requested LAPD give breathalizer tests to all who come to the park. Why did Mr. Rodriguez not mention Park Police who promised the Park Board data six months ago. Again at this meeting, no Park Police were present and Ms. Mendoza had no data regarding incident reports nor dog tickets. 9. The Park Director continues to use “less than dignified names” as “Gaslight strategy” to refer to certain female members of the Oakwood PAB Board. This is the United States in 2010, not 1855 Alabama. 10. CD 11 Bill Rosendahl and VNC President Elect Linda Lucks have done a good job in pitting the low income under represented minority within the Oakwood Community with those who buy property as gentrifiers. VNC and CD11 have worked together to have gentrifiers come to Oakwood Park with a proposal to use the Park part time as a dog park. What VNC, CD11, and the gentrifiers are not telling the people is that the dog park four tenths of a mile at Westminster Park is not used by community because it serves as a shelter for delinquents and other odd sorts who threaten those in the community who bring their dogs to Westminster Park. Westminster Park is filthy, has no park security and has drug sales going on in broad day light. It appears one of Ms. Mendoza’s “unilaterally selected gentrification members” is a silent member supporting an Oakwood Dog Park. The central question focused on what process the community feels is best for selecting future PAB members in 2011. Of the 84 who had an opinion, 7% of the community wants to keep the current unilateral selection process of having the Park Director make the decision. 27% of the community would like to see PAB members and the Park Director choose new members collaboratively. 65% of the community would like to have an Oakwood Park community election on selecting a committe to choose PAB members with the Park Director. This is the rationale for community joining together to challenge the unfair selection of Oakwood Park Board Members. On April 16, 2010, CD11 Bill Rosendahl made a motion to the City Council, seconded by Council person Bernard Parks, to move that $237,000 be given to Penmar Park for after school and preschool care and $182,900 be given to Oakwood Park for after school care from the unallocated balance of the Venice Area Surplus Real Property Fund No. 434, Department 50. Other new accounts include $182,900 to the Venice Beach Board and Rec Center; $76,000 for Venice Beach Washrooms; $22, 207 to the Venice Beach LAPD Substation; and $6,500 for recycle bins for the Boardwalk. On April 20, 2010, Mr. Rosendahl (seconded by Mr. Parks) presented a new motion to the council (#51) to be added to the agenda at the next Regular Council Meeting to amend the above motion to change the funding for the “Oakwood Rec Center from $182,900 to $75,000 with no reasons being given. It appears this 59% decrease is based on the fact that Oakwood Park deals with children who are less fortunate economically than others and whose parents do not have the legal representation to fight back. $182,900 in tact. This advocate has no idea why Oakwood Park Administration is not addressing this issue other than possible continued perks for the Director as is pattern and practice no different than her unilateral selections fo Park Board with no supervision nor oversight. Re: $1500 Cover Up by VNC and Oakwood Park Director, Where Are The Missing Signatures? The Oakwood Park Director’s decision to hold no PAB Board meetings for three months have created more crisis at Oakwood Park. Lizka Mendoza, Oakwood Park Director, has not yet replied when the Survey Sub Committee will meet to discuss the PAB survey. Board members fear that Ms. Mendoza and Ms. Esparza, a former CD11 Deputy, will attempt to dump the sub-committee’s survey and use the survey written by LA Parks Foundation and Rand Corporation which the Oakwood PAB Board voted down. The subcommittee has requested meetings to review the survey and request a time certain meeting to discuss the administration and implementation of the survey. The Oakwood Park Director and Ms. Esparza refuse to reply. As Ms. Mendoza never contacted Sofia Torres, City Election Supervisor for the VNC Election nor apparently the Venice Election Clerks (Ivan Spiegel, Elizabeth Wright, Dante Cacace and Emily ________, no logistics for the survey have been done. The Survey subcommittee has sent numerous notes to Sophia Pina Cortez, Alexa Esparza, Kevin Regan, and Lizka Mendoza requesting a meeting time to review city election procedures and regulations by the Office of the City Clerk regarding doing a survey during a city election. Again, no response regarding a meeting time. Ms. Mendoza, according to Recs and Parks CPRA Legal (pg.1 inter office memo) alleges that Lydia Ponce is Oakwood PAB secretary. This is false. Lydia Ponce and Jill Prestup serve as Secretary Co-Chairs. I have not seen Ms. Prestup since she was part of a coup to elect Cameron Rodriquez President. When the coup failed, Ms. Prestup left and did not stay for the regular PAB meeting. Cameron Rodriquez has been to 2 of 8 meetings and functions since he was “unilaterally appointed” by Lizka Mendoza along with Jill Prestup whose attendance is not much better. Community and PAB Board members for at least 6 months if not more in 2009 requested that Oakwood PAB Board Member Kendra Moore return to her seat on the Oakwood PAB Board after her illness leave. Again “unilateral denial by Lizka Mendoza. My public records request stated , ” Please send me all past minutes justifying Kendra Moore violated the by laws and rules you [Lizka Mendoza ] indicate. Was Ms. Moore “unilaterally excluded by Lizka Mendoza as Ms. Moore asks meaningful questions and represents a large portion of the African American population in Oakwood “. Parks and Recs Legal CPRA state: ” No Minutes Exist” by the Oakwood Park Director’s office to verify Ms. Mendoza’s “unilateral denial” to seat Ms. Moore. As Ms. Mendoza states in the CPRA she has taken minutes at all meetings since March, 2009. Why can’t Ms. Mendoza produce the minutes and discussion regarding her refusal to seat Kendra Moore? Isn’t it fact Ms. Mendoza wanted those new members she unilaterally chose for the Park Board to be those who knew little about Oakwood so that she, VNC and CD11 might easily maneuver them to vote in their direction regarding issues on gentrification.Might Ms. Prestup have received favors from CD 11 regarding her 501c3? I am not sure yet. Ms. Prestup actually stated she was only at Oakwood Park twice in her life for the VNC $5,000 picnics the last two years. Ms. Prestup does not even live near Oakwood. Ms. Prestup also leads the Venice Historical Society, a 501c3 that refuses to share by laws or financial records. Two of the VHS Board of Directors represent Abbot Kinney Realty. Land and money and power over people. It is one big connect the dots with CD11, VNC, Oakwood Park, Venice Historical and those who do “less than clean” tricks for LAUSD Venice Complex Good Ol’ Boys and Girls Club. As well I received the VNC application Ms. Mendoza put through with contact Ivan Spiegel ( a non-elected VNC resident ) for almost $1500 that has no signatures on the application by neither VNC nor Oakwood Park nor LA Parks. Supposedly this screen and projector was passed many months ago by VNC, but still have not arrived at Oakwood Park. This needs investigation. Why can’t LA Parks and Recs Legal CPRA find the application with signatures and dates ? I am requesting that the City Attorney investigate this VNC City Application that was approved by VNC. As well, auditors at Parks and Recs need to investigate the location of this $1500 screen and projector. At the April, 2010 Oakwood PAB Board, Lizka Mendoza must allow Kendra Moore to be seated. Ms. Mendoza’s “unilateral choices” appear a means to appease those in favor of gentrification of Oakwood. The low income under represented minority population in Oakwood are being treated “separate and less than equal”. Ask the community of the antics by Ms. Mendoza and her assistant the night the community held a most successful celebration of African American History Month. Ms. Mendoza and her assistant prohibited a minister from speaking by their bad behavior. This is wrong. 1. Please send minutes of all Oakwood PAB Board meetings beginning with January, 2009 through the present. 2. Please send all agendas of all Oakwood PAB Board meetings beginning with January, 2009 through the present. 3. Please send again the VNC Community Improvement Projects Application Packet with all signatures rather than the one Parks and Recs Legal sent with no signatures. Does a copy exist with signatures? 4. Please send a copy of the purchase order of $1,489.27 from the City to LA Parks and Recs and/or VNC for the screen . and projector. Something appears wrong with this picture. Again, please be kind enough to inform the survey sub-committee when the meeting to discuss the survey will take place. Time is of the essence. Peace. 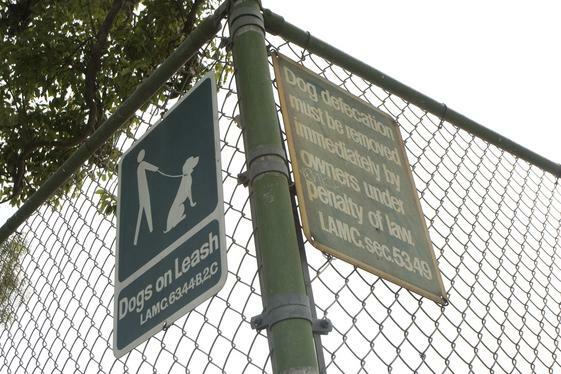 A sign at Oakwood Recreation Center on California Avenue warns visitors to keep their dogs on a leash. Some resident want to let their dogs run free during certain hours. Others are opposed. The community within the Oakwood portion of Venice are quite protective of the public services that have served the Community for at least a half century and in some cases much longer. For at least half a decade, there continues to be conflict between philosophy of community and the Director who operates Oakwood Park who makes unilateral decisions on selection of Board members and park operations with no accountability, transparency, rubric nor oversight. Over a year ago, a Dr. Stoller (spelling ), representing newer residents of Oakwood, attempted to make a portion of Oakwood Park into a dog park for certain hours of the day/ night under their proposal’s monitoring system. Many in the community, right or wrong, concluded these were the same individuals who were pushing OPD. The Oakwood Community was divided. The Oakwood Park Board Director turned against the original Park Board and teamed with her 3 “unilateral self selected” Board members who followed directions. The Oakwood Park Board remains divided in two as part of the cover up by CD11 and Parks and Recs to clean up Westminster Dog Park which is explained below. When I spoke before ABC news, I wanted to focus on my central issue of reform of the Venice-Mar Vista public schools, but I felt the divide and conquer by Parks and Recs, VNC, and CD11 needed to be exposed with ABC. For the last four years,I have worked as an advocate for the Oakwood Park Board. I never miss a meeting. The “dog issue” has been a serious one that no one took any responsibility. When Dr. Stoller came to the Oakwood Park Board representing a “specific group of individuals wanting a dog park at Oakwood”, he never explained why his group did not use Westminster Dog Park 4/10 of a mile away. This is the key question that was never answered. The reason I chose this story for ABC happened after an incident in mid-March 2010 when friends from Chicago came to visit. After driving cross country, they requested to go to a dog park to allow Lucy, a well groomed large Standard grey poddle an opportunity to run. I informed them that I really wanted to go to Westminster Dog Park to check it out. I explained to my friends that the Westminster Dog Park is the responsibility of the office of CD11 Bill Rosendahl, Venice Neighborhood Council, and LA Parks and Recreation. Before we entered the dog park, one of my friend’s who grew up on a family farm in Iowa, saw two girls dealing drugs that was not Cannabis. When we entered the Park the only place to sit was on a small bench as the bleachers were filled, not with Venice residents nor those who have a purpose for being in Venice, but those who enjoyed harassing first time park goers they did not want near their bleachers. A group of about 15-20 on the bleachers cheered when one sent a very large dog with a face scarier than a mean pit bull to sic us. As we sat there, quite frightened, the bleacher people continued laughing loud and pointing. Once we yelled over we wanted to go, the very large dog was restrained my his master in the bleachers and we moved quickly out. Besides meaning scary, the park was dirty and smelled. It felt like leaving a war or riot zone. What we have here is a typical LAUSD “Gaslight” game. Rather than have Dr. Stoller come to Oakwood Park and ask for help with the serious problems at Westminister Dog Park, the group instead came to take over part of Oakwood. This is the problem with VNC, CD11, and Parks and Recs and those who do dirty deeds for them as well as for LAUSD. Rather than have VNC, Parks and Recs and Bill Rosendahl take responsibility for this despicable Westminister Dog Park, they continue their “Gaslight strategy” to allow two sides fight over an issue which is the responsibility of VNC, Parks and Recs, and CD11. I am placing this in writing as many were unclear of my message as ABC provided only 1.5 minutes, but you know what, that was fine. ABC showed their commitment to neighborhoods by hearing the issues. Please, for your own safety, stay away from Westminster Dog Park until VNC, Parks and Recs and CD 11 does their job to clean it up and make it safe. During their stall period, VNC, CD11, and Oakwood Parks and Recs enjoy community to fighting among themselves to keep the pressure off those responsible; no different than use at LAUSD, a slowly sinking Titanic trapped in Orwell’s 1984. VNC , CD11, and Oakwood Park needs new leadership. Peace. Please attend our meeting with Carol Galante from HUD. Ms. Galante is the top-level decision maker at HUD on everything about the Project-Based Section 8 program, and she has the power to help the Holiday Venice tenants and Mercy Housing buy the Holiday Venice apartments, a dream long-deferred. This is the highest-level HUD official who has ever come to meet with us in Venice. HOW: COME TO THE MEETING! Please distribute this far and wide! This is an enormously important meeting for POWER and the Holiday Venice tenants. This evening (2/2/10) at the Oakwood Park Board Meeting, the Park Advisory Board was informed in writing by Director Mendoza that all PAB meetings citywide have been cancelled until April 27, 2010 due to budget cuts. None of the new Board Members “unilaterally” chosen by Director Mendoza were present apparently as their coup to take over control of the Board failed terribly when the Oakwood Community banned together. While it appears Ms. Mendoza goal along with CD11 was to divide and conquer the Oakwood community with Ms. Mendoza’s political “unilateral” selections of new park board members , the exact opposite has happened. Community is coming back strong and demanding “fair play”. Ms. Mendoza has denied the Grant writing sub-committee the opportunity to hold meetings as it appears she had made political arrangements with the RAND Corporation and LA Parks Foundation who were to come in with her failed coup. Since then, the Park Board voted against RAND Corporation’s access from RAND’s planned endeavor to create “RAND data” concerning Oakwood Park. The Board also voted down LA Parks Foundation for their political ties as illustrated in paper work concerning Executive Director Judith Kiefer’s many political donations to political candidates. Ms. Mendoza now states that before the grant writing team may meet, the six members must find a convenient time in the early afternoon for the sub-committee, who are all on the West Side, to go downtown rather than have the Grant Writer Trainer come to Oakwood. Ms. Mendoza stated the Grant writing Director, whose name Ms. Mendoza did not know, insisted the sub-committee ( half who work or go to school full time) must go downtown. This is a lot to ask of volunteers as this becomes an all day function. Both the Oakwood Park Board President and this advocate are physically challenged and wonder if the Grant writing Director for Parks and Recs might reconsider her “unilateral” decision as explained by Ms. Mendoza. Ms. Mendoza directed that each sub-committee member send her three convenient dates. Is there not an easier way for six volunteers to be trained so grant writing and fund raising might be permitted to hold our first meeting? Ms. Mendoza continues to charge under represented low income minority parents $75 per child per month for after school activities at the Park. At the same time , she has stopped since October the opportunity for the Grant Writing/ Fundraising Committee to meet. Please reply as soon as possible. Ms. Mendoza no longer replies to direct e-mail nor sends out revised agendas to the agenda sub-committee. Peace. Today I met for the first time the Honorable Horace A. Allen, Pastor of the First Baptist Church of Venice. Pastor Allen informed me that on Saturday January 16, 2010, Oakwood Park was again filled with dogs off leash making messes. It appears police and park police have bothered his parishioners rather than deal with dogs off leash. You assured the Park Advisory Board this was under control. It is not. Oakwood Park continues to be locked down on Saturdays with locked doors and no staff. This again is unacceptable. You do not address this Saturday issue, Why? Ms. Ponce has included this on the agenda. This advocate is inviting the Venice Heritage Foundation , a historical society in Venice, to contact Pastor Allen as he informed us that the Venice Historical Society, if they still exist as they do not reply to e-mails nor phone calls, has done little to preserve African American 100 year old history in Venice. This is quite sad. Again, please be kind enough to monitor more closely the dogs off leash as this issue is not under control. Dogs off leash in Oakwood is and everyday occurrence! When you call the phone number given out by Park Director the Safety Officers come and harass the people sitting in the park,and along 7th Avenue, while the dog owners rush to put leashes on the dogs and leave the park immediately. The people in the park and surrounding the park don’t call because they’re belittled, arrested, ticketed by the Safety Officers while the dog owners are allowed to put leashes on and leave without a warning. The dog owners know this and return when they choose knowing that as long as these practices go on they don’t have to worry. People aren’t going to keep calling while they’re harassed for sitting there playing dominos or just being in the wrong place when the dog owners come and break the law each and every day. LAPD passes by the park while dogs are off leashes, nothing is said. Individuals that LAPD decide are on their radars (never dogs off leash and their owners which is breaking the law)but always people of color and the homeless. The domino players and homeless feel defeated by the Safety police and LAPD, while those who go home and email lies and made up incidents(RV dwellers urinate and deficate,African Americans are drinking and selling drugs- instant reason for Safety police and LAPD to harass them) walk freely breaking the law with nothing ever happening to them. Where is the justice in this? Same old status quo “Persecute the poor and less fortunate and allow the elite to have run of the mill.” I guess secret meetings with Councilman Bill Rosendahl and LAPD pay off. The new Klu Klux Clan strategy works especially if you have access to the internet. The new sheets over there heads is the Super Highway of cyber space. I wonder who the new ‘Imperial Wizard is? I have received more than one call regarding distribution and cold food being served to seniors at Oakwood Park. These individuals prefer not to talkwith you or with Ms. Zelda James as they speak of retaliation towards them when they make constructive criticism or ask questions. Our seniors do not need to live in harms way or fear cold lunches or be harassed for not having cards for senior citizens no longer made by Parks and Recreation if they ask about their rights as senior citizens. Why do seniors at Oakwood need to call the LA Department of Aging for less than equal services at Oakwood Park? Why are seniors told if they ask for a big TV it is a waste of their time because it will be stolen? I ask Ms. Valentine, acting facilitator, to form a sub-committee at the 1-26-10 Oakwood Park Board Meeting. This committee needs to have lunch at three different Parks in Venice-Mar Vista and come back in February with a report of changes and other recommendations the sub -committee might suggest for implementation at Oakwood Park. Within the report might be a review of the 3 park visit to the Oakwood Seniors and our seniors ideas to be included in recommendations. I suggest that in March, 2010, these recommended changes be implemented as much as possible ( equipment might need to be ordered) and a report be given in March of a second evaluation given to seniors regarding serving of food, cleanliness, and whether food is hot or cold. These forms can easily be developed by the sub-committee. This evaluation data needs to then be given to seniors once every six once as part of Oakwood Park Policy so no senior has to fear retaliation for questioning food service. The Israel Levin Center by the Westminister Dog Park has been rated highly for their food service to seniors. Many individuals can not tolerate “small issues” that might become “larger issues” if not communicated and shared. This advocate was informed that for the Oakwood “Holiday Luncheon” before 12-25-09, the blessing given before the meal was only spoken in Spanish, not in English. Given the nature and the diversity of the Oakwood community, I would suggest in the future that any blessings at events be non-religious and spoken in both English and Spanish and any other language spoken in the community. Might this be passed along for all involved. On 12-08-09, I sent you a public records request regarding a group “you” and part of your “New Elite” appear to want to bring into the park to raise money. This foundation gives 50% to the park and the other goes 50% elsewhere. Neither you nor your “unilaterally chosen New Elite” are willing to respond to where the other 50% of the money goes. Ms. Kiefer, the representative from LA Parks Foundation walked out angry in November and never showed up to make the presentation in December. A sub-committee put together in November by you was to meet with LA Parks Foundation during the first week of December which you cancelled. Then they were to meet 30 minutes before the December meeting which was also cancelled by you. Please send the following public records immediately concerning LA Parks Foundation which you as Park Director seem to want implemented at Oakwood along with the corporate Venice Historical Society President Jill Prestup you “unilaterally” chose as a new Board Member denying LA Human Services (Relations) the right to sit in as a neutral party in the interview. Might their be a conflict of interest here between Ms. Prestup’s Corporation and the LA Parks Foundation? The spread sheet requested regarding LA Parks Foundation is long over do. Where do all of the funds donated to LA Parks Foundation really go ? Please share a spreadsheet on how these funds are used in other Parks and where and to whom the other 50% of the donation is distributed? This gross denial of information is sickening and quite disturbing. These acts remind me of the take over of the ravine in Los Angeles where Dodger Stadium now resides. Could it be that the land in Venice is such a Gold Mine that our City Council and LA City Parks and Recreation want to sell it out? Could it be that eminent domain is the next nasty move? Why is it that LA City Parks and Recreation would rather see the gym sit empty then allow childrens programs and events to go on “Free?”We need to bring this to the media’s attention and let the world see what our corrupt officials who are voted in by the people, are doing in this community. Money shouldn’t be the end all get all for Oakwood Park. You didn’t want to see minorities utilizing the facility and you complained and complained. In the past “The strong City Council people for CD11 always told you ‘If you don’t want noise and to see people why did you buy around a park?” Now the emphasis is charge for everything (which Oakwood’s Park Director does with joy) and get the under represented community out and use the cities policies to do so. I implore all of you to realize that uneducated,ignored children become societies problem. What is going on is wrong and you all know this-right the wrong and stop the games. Re: The “New Oakwood Elitism”- Charge the “Low Income Under Represented Oakwood Minority Teenagers Money or Community Service To Receive Free Tutoring” Violation of Title One ? In a year and about three months you have turned Oakwood Park, a park for the Oakwood community, into what one may refer to as “The Park for the New Elite and those who favor Gentrification and turning part of Oakwood into a dog park”. Rather than allow community the right to use the park annex for a small group meeting, or a repass,a study group,or a baby shower,etc. where those holding the function set up and clean up, you have decided along with your “New Elite”, the Doctors and Lawyers and the Politicians, to charge community $75 dollars an hour to use this annex even though it sits empty. As well you and your “New Elite” want to charge the low income under represented minorities in the Oakwood community fees to sit in the park’s chairs as well as charge to use the tables. In a non-advertised public meeting held last night December 8, 2009, never advertised to the community, which you called an Orientation Meeting, you demonstrated a “mean spirit” along with your new found “Elite” you “unilaterally” chose denying LA Human Relations the right to sit in on the interviews to allow fair play. On top of this you planned with never sharing with the Board your “unilateral” plan to bring into Oakwood Park the RAND Corporation and their mission and/ or their hidden mission different than what they inform the public. As well, you and Andrea Epstein, Bonds/ Volunteer Chair Coordinator and former Deputy to CD11, are bringing in LA Parks Foundation; a 501 c3 where “elite” donate money and half the money goes to Oakwood Park and half the money goes somewhere else. As a teacher and tutor in this community for almost 35 years, I was stunned when Mr. Rodriguez and the other “New Elite” focused on charging low income under represented minority Oakwood teenagers who perform “less than basic on Standardized Assessments” for the right to free tutoring. Mr. Rodriguez made it clear that if a student cannot afford the tutoring, the student would perform an hour of community service after in return for the tutoring. According to Mr. Rodriguez, teenagers do not appreciate tutoring if there is no payback by the student. He kept referring to the training of referee’s, never explaining himself. 1. The educational history of Cameron Rodriguez ? Is he a PHD Chemistry/ biology major at UCLA as you stated or was that less than true? 2. Does Cameron Rodriguez live across the street from the park as you indicated and why did you direct him not to share his credentials? 3. What is Cameron Rodriguez’s reason for applying to the PAB Board if he has never been to the Park and no one at the last PAB ever heard of him ? 4. For those parents who are currently paying for after school tutoring at Oakwood for their teens, will these children, following Mr. Rodriguez’s model, also be doing an hour of community service in return for the tutoring ? 5. Why are you, the Park Director, now stating that the purpose of the Park is all recreational rather than educational when our Venice kids are in harms way of never obtaining a high school diploma? 6. Where do all of the funds donated to LA Parks Foundation really go ? Please share a spreadsheet on how these funds are used in other Parks and where and to whom the other 50% of the donation is distributed? We who love children and all children, need to weigh in on this immediately. We have sat in at Oakwood Park Advisory Board meetings monthly and tonight those of us who attended learned that some of the children of Oakwood who are involved in football activities and cheer leading would not be able to attend a tradition of having Halloween Festivities being held at Oakwood Recreation. When two Parents brought this to the attention of the Park Advisory Board (One was a Grandparent who oddly enough is the President of the board)the reply to them “Well believe it or not the Westside Bulldogs children are not the only children in the neighborhood” stated by the Park Director Lizka Mendoza. That is true but their needs must be considered too. All children should have the opportunity to attend since it’s children this great party is being held for. Let’s give respect to all the children of the community. It’s rare that it falls on a Saturday and it will be great fun for them to come and enjoy all the wonderful activities that are planned for them that night. I know we can make this work for all the children of Venice. The PAB board didn’t have a say on the time, and this is what some of their duties entail, and there input could’ve assisted in the time being workable for all. We need transparency and most of all accountability in running Oakwood Park. If organizations give they should do this with no strings attached. Excluding children shouldn’t be overlooked because enough questions weren’t asked, and Park Advisory Board members weren’t consulted. Let’s right this and get the hours changed as suggested by two board members Lydia and Jataun. I attended the meeting held on September 29, 2009 and I have many comments that are pertinent to this entire Park Advisory Board (being informed and having input on all the events and scheduling of events). 1. PAB put together agenda for the meeting and it was not used? Why? In the Community Meeting held September 16, 2009 @ Oakwood Recreation – it was stated that this would be wonderful if the PAB would write the agenda -Lizka Mendoza. 2. Halloween Festival was in question? The time being to early? It would exclude many of the children who are cheering and playing football with the Westside Bulldogs they have all day games on October 31, 2009? The community has been accustomed to having the park to rely on for good times with the children, homes have not been child/ren friendly with the high fences, so parents don’t take their children to trick or treat they use the park for fun and good times. Parents requested that the time be changed so the Westside Bulldog children could participate, and the park director said “Believe it or not the children of the Bulldogs aren’t the only kids in the community.” All children including the Bulldog children should be thought of in the process of making a time that is amicable to everyone. If VNC , LAPD, CD11 and LA City Parks have a problem with these children then to bad because Halloween is special for all children! PAB seemed unknowing of the time that had been allotted for the Halloween festival? Was the time ever discussed with the members? 3. After school rate hike seems to be another issued that was not discussed with the PAB, they appeared to have no knowledge of the rate hike. Many children cannot afford to participate with these fee’s Community wanted to know why was this done? This afterschool program should be available to all children that need assistance in their homework, fee’s should not be and issue for children who need to be in the program and who need to utilize the park for safety reasons until their parents get off of work. Is this not what the parks are for? 5. Oakwood doors being closed during hours of operation? Why? Keeping children safe on the inside and out should be important! Where is all the “Fear” coming from get over the fear that has come over this beautiful facility the doors need to be open. The after school program can go on with the doors being open to any and all children who cannot afford to pay. The doors are closed and this means what ? Money shouldn’t be the mitigating factor in who uses this facility,assist ,open up Oakwood’s doors and allow everyone equal access. The rooms to the South of the building could be used for the seventeen children that attend with the expectation of it filling to capacity with twenty-five children capacity. This is too much square footage to be locked up for four hours. 6. PAB had agreed one year ago that the PAB should be larger- four people, aren’t enough to run the park effectively. The applications have been in and accepted, but no interviews have been held. Why? PAB asked when the new members would be chosen? The PAB would love to have access to the interview process to have input also. The community asked if they could be involved also? Why has the PAB request not been fulfilled and the members not seated? Who is Andrea Epstein and why is it that her being there is more important then community and present PAB members? Why is the community being met with all these obstacles and being pushed out of the process? CD11 cannot have the right to put there person in to choose PAB members is gentrification the reason that CD11 has become so interested in who sits on this board? CD11 is there for what reason? The community and PAB members cannot attend but CD11 is vital? Please elaborate? 7. Budget for Oakwood was on the agenda that PAB members put together why was this not addressed? PAB and the community has the right to see this and make suggestions on how the money is best used. Budget request was for 2008/2009 and 2009/2010. Is this something that the PAB and community could receive? 8. There is a definite rift that is tearing Oakwood park apart, solutions need to be discussed openly. PAB and concerned community members who attend all the PAB meetings regularly should have input on the daily everyday running’s of the park. The compliance of the Director with PAB and community is vital- it has left a sour taste in the mouth of many community members and the present PAB. 9. Who pays the employees of Oakwood park is it the city or is it the fee’s that are paid to Oakwood via after school program, basketball, softball? This needs to be clarified because the understanding seems to be if the program doesn’t make money the employees don’t get paid? Community is extremely important in making this program successful, communication is crucial. Money should not be the operating word for children getting the best of the best. This park has always been open to all the children and teens and no exclusion. Oakwood Recreation park was famous for the programs it offered and children and teens would travel far and wide to come and participate in what was being offered. The exclusion system that has reared it’s ugly head needs to be eradicated immediately. There are enough resources out there for everyone who wants to be in Oakwood and who wants to have their children attend. Gentrification is ugly and it’s greed is not going to be the reason that Oakwood cannot continue to serve any and all people who come to enjoy this beautiful park. Generations of well respected people have sacrificed to make this park special and we will not be pushed out by non-agreeable and less then agreeable city officials who supposedly work for all the community – CD11, LAPD, Venice Neighborhood Council, LA City Parks, cave to individuals who sit and complain daily via emails, never coming out to attend meetings to state their concerns. When you move near a park you must get on board with what the park is famous for having “People.” Oakwood park should be open to all who want to come and play and get along with neighboring people. I formally challenge the procedure of the Park Advisory Board selection process, it’s roots are antiquated and exclusionary. I make this challenge as a resident who is involved and concerned that the present selection process is not fair to the community and ‘everyone’ it serves. The process needs and overhaul and it needs to be open and fair process that any and all who are interested to join in. I value Oakwood Park lets make it what it’s meant to be, open, fun, free, assisting the community in keeping all children safe and interested in being individuals who are giving and loving of where they play and learn. I will await a reply on my request to contest the policy and procedure of the choosing of Park Advisory Board Members. At the Oakwood Park Board Advisory Meeting tonight, after over a year of waiting, CD11 Deputy Arturo Pina and Oakwood Park Director Lizka Mendoza, informed those in attendance that a volunteer coordinator Andrea Epstein would be doing the interviews for the Oakwod Park Advisory Board. CD 11 Deputy Pina got quite upset when a guest asked, “Who is Andrea Epstein ?”. The Board was told by Mr. Pina and Director Mendoza that Andrea Epstein was a fair volunteer for Oakwood and has no bias. We were also told that the Oakwood Park Director Lizka Mendoza was writing a grant with Venice 2000, a nonprofit who works very closely with CD11 and has received favors from CD11 as well as from Venice Community Housing Corporation. We were not told about this Oakwood Park-Venice 2000 grant meeting in advance nor were we given the date of the next grant writing meeting when asked. Neither were we told who is the grant writer from Venice 2000? Why? Ms. Mendoza also told the Board she received $2,000 from Venice Neighborhood Council to pay for a Halloween party. VNC appointed Parliamentarian and LAUSD Trickster Ivan Spiegel just happens to be close with CD 11 Bill Rosendahl and his Special Deputy Mark Grant who appears to have no job description. We knew something was not right with this picture as soon as Mr. Pina became quite defensive about Ms. Epstein. Doing research this evening, I found that Andrea Epstein was not just a friend of Mr. Pina, but she serves or served as Bill Rosendahl’s Field Deputy for Brentwood and Palisades. Knowing the personal animosity CD 11 has towards several candidates who must be interviewed by Ms. Epstein, these individuals are doomed before they even go for their interview. These are the continued games of CD11, but many of us believed the “less than kind games” were over with Parks and Recs when Al Henriquez replaced Lydia Ritzman. Tonight we learned Ms. Ritzman was back. Surprise. What happened to Al Henriquez who Ms. Mendoza called him her supervisor, not Ms. Ritzman, at the last PAB meeting ? Bill Rosendahl is known for taking care of his friends at VNC and Venice 2000 and his retaliation for those who question the “pattern and practices” of those organizations whose self interests come first before those of their constituents. Its all about money and land. In this case it appears Ms. Epstein supports the gentrification of Oakwood and the turning of Oakwood into a “partial dog park”. Why is there no individual involved in the interview process from the Oakwood community ? It appears Ms. Epstein plans to help create a Park Board to represent those who force gentrification and treat the Oakwood community no different than if it was 1955. Racial relations was a topic of conversation this evening and the less than fair treatment of the low income under represented minorities. In Palisades and Brentwood, Ms. Epstein’s playground, race relations is not an issue. Please share with us “page 10” of what Ms. Mendoza refers to as the City Rules on Parks and Recs which she states that the only individuals allowed to attend interviews of Park Board members are the Park Director and the volunteer; in this case, Ms. Epstein, who is/ was really the field deputy and colleague of Arturo Pina. What makes one want to yell “foul” is that Mr. Pina , Park Supervisor Lydia Ritzman, Ms. Mendoza, and Andrea Epstein consider all of us who never miss a Oakwood PAB as a bunch of “fools” who are unable to see through their political and financial agenda to create their own PAB. If I do not receive a copy of page 10 as discussed above a Public Records Request will be sent to Kevin Regan on October 2, 2009. Fortunately for the community, LA Human Relations will continue to attend the Oakwood Park PAB meetings. VENICE — The long-standing gentrification issue in a historically black and Latino neighborhood is now going to the dogs. That’s the problem that some residents near the Oakwood Recreation Center believe is underlying a growing conflict between dog owners who run their pups off leash at the local park and those who want to keep the animals securely tied and away from children. The increasing affluence of Venice has been a sensitive issue that has popped up throughout the Los Angeles neighborhood, including along Abbot Kinney and Windward Circle where residents are trying to fight off chain stores, along Rose Avenue where a Whole Foods moved in last year, and for the past 10 years, the Oakwood area where long-time residents complain about the presence of off-leash dogs, which is in violation of the city ordinance. The lack of canine-friendly facilities has also been an issue raised by many dog owners who point out that the only other real alternative to Oakwood is the Westminster Off-Leash Dog Park, which is located about a mile away but has been criticized as being unkempt and filled with unfriendly-looking pit bulls. A group of dog owners comprised of neighborhood newcomers and old residents are proposing a pilot project to permit dogs to run off leash at Oakwood Recreation Center between the hours of 6:30 a.m. to 8 a.m., a time when the park is mainly devoid of any activity. Stockel is among a group of 10 residents who are trying to push the pilot project, presenting the idea to the advisory board last month. He said that the group is made up of courteous dog owners who make it a point not to bring their dogs off leash when there are children in the park, and even clean up after other pups who leave their waste bind. He said that there is animosity in the community that predates his involvement in Venice and that the goal is to close that divide. He said the safety of the children takes precedence over the dogs, but stresses that the park is empty during the morning. L.A. Councilman Bill Rosendahl, who complained in 2007 when Santa Monica city officials decided to restrict the off-leash dog facility at Airport Park to residents within the city limits, said he is waiting to hear from the advisory park board’s recommendation before introducing discussion to the City Council about the matter. The dog park at Airport Park has since been opened to nonresidents. He said that no new dog parks have been created in the district since the issue in Santa Monica, noting that one in Westchester just shut down last week. Lizka Mendoza, the director at Oakwood Recreation Center, said that any changes to the off-leash dog rules at the park would have to apply to the entire city. The park, which takes up about two blocks, is mostly enclosed, with a few openings near the athletic fields. Mendoza said that she sees dogs off leash all the time. The Los Angeles Police Department and Office of Public Safety are responsible for enforcing the rules of the park, she said. Mendoza said the solution to the problem would be to refurbish Westminster Dog Park. “There needs to be space for the dogs and a safe space for kids,” she said. But members of the group proposing the pilot project said they are willing to listen and don’t see themselves as the opposing side, hoping to instead work through a solution. M.B. Boissonnault, a 10-year Venice resident, said that people come and go out of the neighborhood all the time, adding that she serves the community by volunteering with various organizations. She adds that its better to exercise dogs than leave them cooped up in a yard where they have no social interaction. Many dog owners said they have been cited for having their dogs off leash. Jataun Valentine, whose family has lived in Venice for 95 years, said her 94-year-old relative was cited for simply carrying a daughter-in-law’s dog. Valentine, who volunteers to help senior citizens, said her concern was that the presence of dogs results in fewer usable space for the elderly. “There’s a big area where the seniors can’t use because most of them are walking with a walker and it would be too dangerous to sit,” she said. Ponce said that she will take an objective look at the proposal, which will come back to the park advisory board this month. WEDNESDAY, FEBRUARY 23, 2010……6:30 P.M. NOTE: HOSPITAL LOCATED AT THE ENTRANCE OF DODGER STADIUM AT SUNSET BLVD AND ELYSIAN PARK AVE.
FREE PARKING ON THE HOSPITAL PARKING LOT. AGENDA ITEM NO. 6 TITLED “SPECIAL PRESENTATION” WHICH BARRY SANDERS WANTS TO GIVE PPPs THE 30-50 RECREATION PARK CENTERS DUE FOR CLOSURE (I.E. ROSE HILL REC CENTER ALREADY NOTIFIED) WITH OUT PUBLIC INPUT, OVERSIGHT OR FUTURE SUPERVISION. THE QUESTION IS DO YOU WANT YOUR CITY NEIGHBORHOOD PARK TO OPERATE WITH OUT YOUR FAMILY, FRIENDS OR NEIGHBORS INPUT OR SUPERVISION? This is really fascinating! Thank you so much for posting this information, I’ve been doing research on Oakwood and you’ve provided a lot of resources. Feel free to check out the photos I’ve posted on my blog!